A Dahabiya is a beautiful and an elegant crafted sailing boat, with modern comforts. It provides all the facilities of larger cruise ships, while offering the advantage of a more intimate setting. The smaller size of the boats makes it far more relaxing and less rushed, with more time to enjoy just being on the Nile. It glides silently along the banks of the river, while the water sloshes softly at the bow. The Dahabiya is ideal for larger groups or big families, up to 20 people. Depending of the boat size it has 6 – 10 comfortable cabins, bathrooms, a kitchen, a living area and a sun deck. The name Dahabiya comes from the Arabic word ‘Dahab’, meaning Gold. The Dahabiya was given its name from the golden colour of the original vessels, which were common in Egypt in the early 19th century, when wealthy Europeans sailed the Nile. This incredible journey down the Nile is a voyage of discovery in the truest sense of the word, encompassing not only the magnificent monuments of the ancients, but also the little explored heritage of the ordinary Egyptians. This safari itinerary combines historical and mystical sightseeing with the peace and tranquillity of a Nile journey as you dreamt about. We follow the fertile ribbon of the Nile as it weaves from the ancient city of Thebes, deep into the southern boundaries of Upper Egypt. You will visit all the famous sites including the Valley of the Kings, Luxor Temple and Karnak Temple as well as others not on the main tourist map such as El Kab. The Nile south of Luxor is increasingly hemmed in by the desert, its banks lined with well-preserved Greco-Roman temples at Esna, Edfu and Kom Ombo, its lush fields with palm trees and villages. It’s the perfect place sailing the Nile Dahabiya Style. This itinerary can also be made in the reverse direction: from Aswan to Luxor. 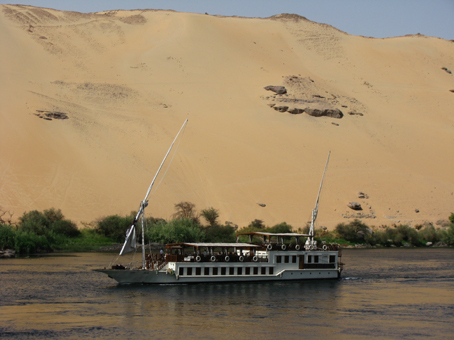 We also can arrange the same voyage on board of a Sandal or a Felucca. The pace of a sail trek is dictated by wind and river conditions. The authentic Nile boats are built from wood and they sail without motor. The boats have to be light in order to be able to sail. On distance they will be accompanied by a tug boat which pulls it in case of wind lack or emergency. During the night the Dahabiya won’t sail. It will moor on the banks of an atmospheric Nile island or the riverbank, away off the beaten tourist track. The price of the Dahabiya Nile Safari varies according to the number of travellers and the season. We must reserve the Dahabiya entirely for going on safari. The price will thus be in proportion to the number of travellers.